Life and death balance each other like day and night. Life should be vibrant and death should be restful. Life should be lived in such a way that when death comes one can rest deeply. Death is very important for the soul to process its life experiences and to bring its accumulated wisdom into the soul. During death the experiences of the lifetime are reflected upon and then incorporated into the soul body. The soul body is nourished during this time and becomes stronger and more vital from a restful death period. Without a proper death period, the soul is reborn agitated, confused and filled with anxiety. If it is able to rest properly in death, and gets to merge consciously back into the soul, then when it is reborn, it will have a strong sense of self, great health and a clear purpose. Death is an important part of the Soul’s journey. Death is a preparation for life and life is a preparation for death. Both further the expansion and growth of the soul. Death does not like stagnation. When the life energies are not expressed and active, death takes it away to become nourishment for another expression. Letting go is allowing space for transformation and finally for bringing in something new and more appropriate. It is only normal that we change, grow and outgrow. Therefore we also have to allow our environment to change and grow with us. To do this we have to learn how to let go. The universe is abundant. There is no shortage of anything. You can safely let go. More will always come. When you let go of something a space is created which the universe will fill as fast as possible. Death stands with his right hand in the gesture of blessing as he takes the souls after their journey on earth. Their bodies flow down the astral river between worlds. There are all types of people, young, old, healthy and sickly. All are submerged in the cleansing waters and taken into the afterworld. The body goes back to the elements, the subtle bodies dissolve into the psychic waters and finally the soul moves back into the stars, the cosmic womb for deep rest. All is good, all is quiet and all is blissful. 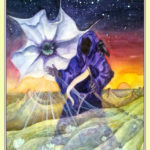 The Datura flower is a mystical flower that helps one to shift dimensions. It is beautiful, poisonous and psychedelic. It is also the flower sacred to Lord Shiva, the original god of death and transformation. The earth is dry and bare. There are many volcanoes, burning and transforming what is no longer needed. Through this destruction the ground becomes cleared and when the lava cools, new life will find fertile soil in which to flourish. By finding rest in your heart and connecting to the sanctuary of silence within, you see more clearly what is meant to be in your life and what needs to be released. Death asks you to meditate on life. It allows you to recognize life as a fleeting moment; a short opportunity that will pass. Do not hold onto things that restrict your flow. Surrender them into the river of transformation so that this precious time on earth is free to flow and be alive. 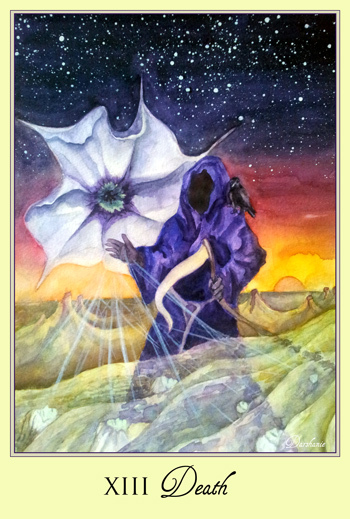 This entry was posted in Major Arcana, Tarot on July 18, 2016 by darshanie.